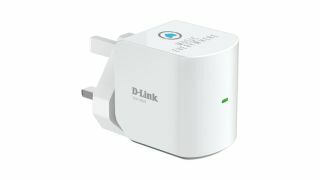 D-Link unveils mydlink Home Music Everywhere streaming device | What Hi-Fi? D-Link has expanded its range of smart home products with the unveiling of mydlink Home Music Everywhere – a device that can stream music from your smartphone, tablet or network-connected media player around the home. If you want to stream music but don't want to trade in your existing, non-wireless speakers, D-Link says its new device is an "affordable upgrade" that works with almost any connected speaker or a home stereo with a 3.5mm jack. How does it work? Well, it sports a one-piece wall-plug design that can be taken around the home depending on where you want to listen. Alternatively, you can use multiple devices and move from one room to another with one click. Music Everywhere can stream music tracks from any network-attached media player or music app via a mobile device provided there is DLNA or AirPlay support. And the device itself just requires a home wi-fi network when setting up. If you don't have a Wi-Fi Protected Setup (WPS) router , you can download the QRS mobile app or log into the device's web configuration using an internet browser. Further more, Music Everywhere can also extend your home's wireless range. D-Link UK&I senior business manager Paul Routledge said: "Most households now have digital music libraries spread across several devices, combined with music from online streaming services. Music Everywhere makes it incredibly easy to tap into these. "It also boosts Wi-Fi coverage in hard-to-reach areas, such as basements and upstairs bedrooms, ensuring a great listening experience, no matter where you are in your home. Music Everywhere helps you turn your simple home into a smart home." You can expect the mydlink Home Music Everywhere to set you back around £40, excluding VAT.